After a night out of the kitchen last night, today we resumed our world tour. Tonight’s top, Thailand. First Born has identified it on the map, read a book about it, drawn the flag and listed similarities between Japan and Thailand. I hope he always loves learning this much. And in such a self directed fashion. Every dish was approved by all family members this evening. Wins all around. Hooray for Thailand! Although First Born did claim he enjoyed the Japanese more, the state of his bowl says otherwise. The soup was light, luscious and distinctly Thai with the flavours of lemon grass, garlic, ginger, lime and chilli blending perfectly with the crab meat and corn kernels. The fried rice was simple compared to the Chinese variety but still flavourful and beautifully accompanied by the pineapple and cucumber sambal. The cucumber salad is an old favourite of mine and although I omitted the sliced red chillies for the sake of the Ankle Biters, it was as refreshing as I remembered it to be. On a sad note, my omelette broke up upon folding so lacks the delicacy of presentation I would have liked. Fortunately the flavour was unaffected. The addition of fish sauce to the egg is just superb and the prawn filling was the perfect match. Thai recipes are from Step-by-Step Thai Cooking, published by Bay Books. 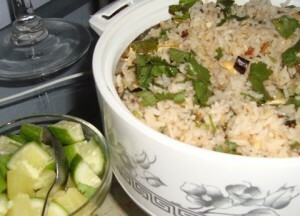 Place garlic, shallots, lemon grass and ginger in thermomix and chop finely (or do it by hand). Scrape down the sides of the bowl. Add oil and cook for 3 minutes on 100 degrees, soft speed or until aromatic. Add stock and milk and bring to the boil (5 minutes, 100 degrees, speed1). Add corn and cook for 5 minutes (100 degrees, reverse speed 1). Add crab, fish sauce, lime juice and brown sugar. Briefly stir (3 seconds on reverse speed 3). 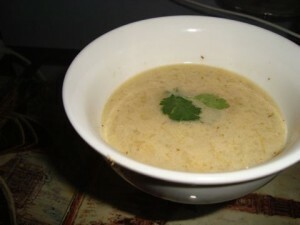 Serve immediately topped with coriander leaves. Heat half the oil in wok, add garlic, lemon grass, coriander root and chillies. Cook over medium heat for about 20 seconds, or until aromatic. Add prawns and stirfry until they change colour. Add spring onions, pepper, fish sauce and brown sugar. Toss well and remove from wok. Beat eggs, water and fish sauce together until foamy. Add remaining oil to wok and stir around to coat the sides. Heat wok and when very hot, pour in the egg and swirl around the wok. Allow mixture to set on the underneath edges, frequently lifting sides once set and tilting the wok to allow unset egg to run underneath. Repeat until all the egg is cooked. 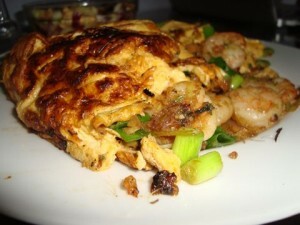 Place 3/4 of the prawn mixture in the middle and fold the edges of the omelette over the top. Slide on to a serving plate, top with remaining prawns and garnish with spring onions and coriander. Heat 1 tablespoon oil in wok. Pour in egg nd swirl to make omelette (see previous recipe). Cut into quarters, flip each quarter to set on second side. Remove and slice into thin strips. Add remaining oil, reheat wok, add garlic, spring onions and shrimp. Stirfry for 2 minutes. Add rice and stir fry for 5 minutes, tossing constantly. Add sauces, coriander and omelette strips. Toss well. Remove from wok and serve. Combine pineapple and cucumber in seperate bowl and serve on the side. Slice cucumber in half lengthways, Remove seeds with a teaspoon and slice thinly. Combine vinegar and sugar, stirring until sugar dissolves. Toss through cucumber chilli sauce, onion and coriander. Marinate at least 45 minutes. 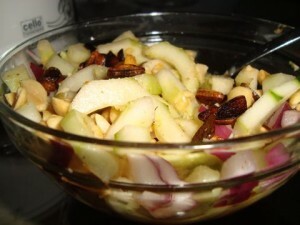 Just before serving, add peanuts, garlic and fish sauce, toss lightly. *thinly slice garlic cloves and cook in oil over a low heat until golden. Cool and salt before using. Tomorrow night, we move to our last Asian country, Vietnam and then we’re off to Europe! I should add that First Born has decided that when this week is over, this will be a weekly event. The next country on his list is Niger. I suspect this is going to be challenging! In order to achieve the greatest taste sensation from your Thai cooking, be sure to start with fresh ingredients. Dried and packaged lemongrass, for instance, is hardly worth comparing to the fresh version (fresh lemongrass is available in all Asian shops and markets).